This recipe is an appetizer not a dessert as known today. There were blancmange recipes for desserts in the Middle Ages when they did not have chicken breast as an ingredient. Although the recipe contains Arab ingredients: almonds, sugar and rice, it is believed to have originated from Provence, France. Sent Soví, the 13th C Catalana cookbook has a recipe for it, while Chaucer relates that his 14th C cook in Canterbury Tales made it with fish instead of meat during Lent. Put the chicken breast in a sauce pan just the size of the meat. Cover with water and bring to a boil. Skim off the grease and the foam. Boil gently 25-30 minutes or until tender. Let cool in the broth so that it does not dry out. When the meat and the broth are cool, remove the skin and the bones. Separate the meat into threads. Set aside with just enough broth to cover it. While the chicken is cooking scald the almonds and remove the skin. Fry them in olive oil until toasted. Remove them and pat dry and set aside. Reserve 1/2 c of these almonds for garnish. Measure out 3 cups of broth. Put the 1 1/2 c almonds in a blender and grind them. Add the broth and continue grinding. Strain the mixture through a cheesecloth. If the strained mixture, which is almond milk, does not measure three cups add more broth. Put the almond milk in a sauce pan and add the ground rice. Bring it to a boil and reduce heat. 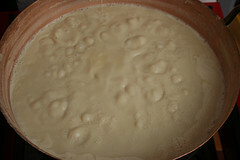 Boil gently stirring frequently until the rice is cooked and the mixture has the consistency of risotto or a pottage. Be very careful not to let it burn. Add the chicken and stir constantly until all is well mixed. Add lard or chicken grease which should be cold. Stir the mixture until the rice has totally absorbed the fat. Add with salt and sugar. Pour into soup bowls and garnish with almonds and pomegranate seeds.